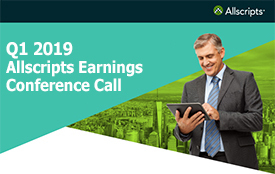 CHICAGO, Feb. 10 /PRNewswire-FirstCall/ -- Allscripts-Misys Healthcare Solutions, Inc. ("Allscripts") announced today that it has reached an agreement in principle, subject to negotiation of and entry into a definitive agreement, to sell its Medication Services business. Closing of the transaction is expected to be subject to customary closing conditions, but no assurances can be given that a definitive agreement for the sale will be entered into or that the conditions to consummating the transaction contained in any such definitive agreement will be met. Allscripts' Medication Services business (or prepackaged medications segment) provides point-of-care medication management and medical supply services and solutions for physicians and other healthcare providers. "The proposed sale of our Medication Services business increases our focus on our core healthcare information technology businesses at a time when we expect electronic health records and electronic prescribing, along with our interoperability and connectivity efforts, to receive a substantial boost from the federal economic stimulus package," said Glen Tullman, Chief Executive Officer of Allscripts. "We want the total focus of the business to be on taking advantage of this opportunity to accelerate growth. The transaction would also provide the Medication Services business with an opportunity to invest and grow with the total focus of the new company." As part of the transaction, Allscripts intends to continue to offer medication services to existing and future clients of Allscripts under a co-marketing agreement. Allscripts (Nasdaq: MDRX) uses innovation technology to bring health to healthcare. More than 150,000 physicians, 700 hospitals and nearly 7,000 post-acute and homecare organizations utilize Allscripts to improve the health of their patients and their bottom line. The company's award-winning solutions include electronic health record, electronic prescribing, revenue cycle management, practice management, document management, medication services, hospital care management, emergency department information systems and homecare automation. Allscripts is the brand name of Allscripts-Misys Healthcare Solutions, Inc. To learn more, visit www.allscripts.com. This press release contains certain statements other than historical facts, which constitute forward-looking statements within the meaning of the safe harbor provisions of the Private Securities Litigation Reform Act of 1995. Readers are cautioned not to place undue reliance on these forward-looking statements, each of which is qualified in its entirety by reference to the following cautionary statements. Forward-looking statements speak only as of the date hereof and are based on current expectations and involve a number of assumptions, risks and uncertainties that are beyond Allscripts-Misys' control and could cause actual results to differ materially from those projected in the forward-looking statements. Risks and uncertainties that may affect forward-looking statements are described in the reports filed by Allscripts-Misys with the Securities and Exchange Commission (the "SEC"), which are available at the website maintained by the SEC at www.sec.gov, including without limitation Allscripts-Misys' Annual Report on Form 10-K for the year ended December 31, 2007. Allscripts can give no assurance that any of the transactions related to the Medication Solutions Group will be completed or that the potential conditions to the transactions will be satisfied. Allscripts undertakes no obligation to revise or update any forward-looking statement, or to make any other forward-looking statements, whether as a result of new information, future events or otherwise. Allscripts is not responsible for updating the information contained in this communication beyond the published date, or for changes made to this communication by wire services or Internet service providers. both of Allscripts-Misys Healthcare Solutions, Inc.